No beer lover should visit Toronto without a short side trip a few miles northeast of downtown to the Black Creek HIstoric Brewery - located in the center of the Black Creek Pioneer Village attraction. 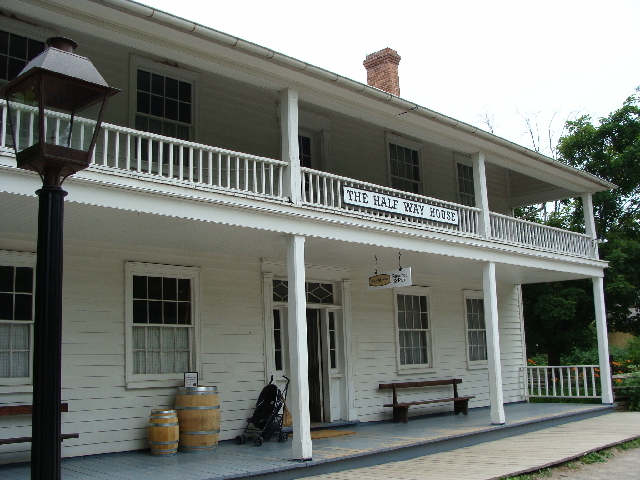 The brewery, located in the cellar of the old "Half Way House," demonstrates the way beer was made in Canada back in the 1800s. Tours allow visitors to sample the beers from wooden casks and sip commercial examples of the ales in the pub next to the brewery. The pub also offers menu items such as chili, tourtiere, ploughman's lunch and Mediterranean dips. This short video features the head brewer of Black Creek in the small brewhouse. Traditional beers made here include Dark Ale, Pale Ale, Porter and Stout. Twice daily, visitors are encouraged to join the tour of the brewery, hop garden, grain mill and barrel cooperage. The tour ends with samples at the brewery. Pioneer Village opens daily from May 1 through December 31 (except for December 25 and 26). Check www.blackcreek.ca for complete details. Black Creek also makes a great family outing - the kids learn about history while mom and dad sample the historic ales. Granite brewpub, located just a few miles north of central downtown, ranks as one of Toronto's very best brewpubs. Choose from hearty pub grub and several delightful ales - including many authentic cask conditioned versions such as a pale ale, old ale, barleywine, best bitter and IPA. Upon your departure, be sure to take home a growler to share with friends. This microbrewery is housed in the heart of central Toronto and produces fine bottled and draft beers that can be found in pubs and retails stores throughout the city. Choose from Blonde Lager, Pomegranate Wheat, Dutch Amber, Nut Brown Ale and more. There is no better shrine to perfect beer and food pairings than Toronto's Beerbistro. Co-owned by our good friend and beer writer, Stephen Beaumont, this popular establishment's beer menu groups current local craft brew and import selections by common flavors and mood of the imbiber - what a creative idea! Join Bar Manager Dayna Guy on a stroll through of the delightful Beerbistro's bar, dining areas and kitchen. Brian Morin, co-owner and chef, has filled the food menu with scrumptious items such as beer flatbreads, Pilsner Maki roll, sticky lamb ribs, lobster quesadillas, beer bread pizzas, chickpea Tikka Masala, lobster mac and cheese, grilled salmon, and a mind-blowing variety of fresh mussel bowls. To find out more, click on www.beerbistro.com. Picture above is Blake, manager of the wonderful Victory Cafe. Victory is owned by devoted beer lovers and features some of the best regional craft brews available in Ontario. In this video, Owen Ogletree visits the July 2009 Summer Cask Ale Festival held at the welcoming Victory Cafe beer pub. The Victory owners love cask ale, visit the Great British Beer Festival on a regular basis, and have brought an entertaining and educational cask event to Toronto. Featuring almost 20 local Ontario casks, Victory's summer cask festival drew almost 300 beer lovers. Thel Melton and Kerri "The Beer Wench" Allen sample Ontario cask ales at the Victory festival. Highlights included County Durham's Hop Addict and Hop Head, Granite's Hopping Mad, Great Lakes' Orange Peel Ale, Black Oak's Summer Saison, Mill Street IPA, Cheshire Valley's English-style Mild, and Cameron's High Hop Silver. This upscale brewpub is part of an international chain featuring European-style brews and food items. Be sure to explore the beautiful upstairs of the pub that seems to go on forever. Pictured above is Adam, proud owner of Abbot on the Hill. The pub is friendly and attractive and features the best Belgian-style ales in the city. The pub does a regular cask ale and stocks UK-style and other European beers as well. The owners are thinking of taking customer ideas and doing a vote for a name change for the pub. "Nun in the Valley" perhaps? The Bier Market offers more than one establishment in Toronto, and the Esplanade locale features a big front patio, roomy bar area and restaurant, huge keg cooler, and quite an interesting food menu. The beer selection is a bit mainstream and could benefit from the inclusion of craft brews from smaller, local breweries. One of Toronto's most beloved beer bars, C'est What stocks only craft beers from Ontario. What a fantastic selection of drafts, bottles and cask ales! This upscale restaurant focuses on Belgian beers, mussels and other traditional Belgian menu items. The beer selection is respectable and the food items are tasty. Who doesn't love a fat Belgian? A diverse mix of locals do love Local 4 - and for good reason. This welcoming neighborhood bar offers a great selection of brews and some ultra-cool food items. Check out the back beer garden and hip front bar areas of Rebel House - one of the first Toronto pubs to "go out on a limb" and feature Ontario craft beers. What was once a huge distillery now serves as a trendy shopping and arts area, and Mill Street brewpub makes up the heart of Toronto's Distillery District. This lovely brewery/restaurant offers pleasing food and around 15 house-made beers on tap. Kerri and Thel work their way through the voluminous Mill Street beer sampler. All the brews are clean and highly drinkable, but many are a bit light in aroma and flavor for their respective styles. The Dry Stout and Milk Stouts shine as our robust favorites. A nice cask ale is also on hand-pump. A beer pub located right across the street from a major Toronto church? Toronto is a great city, and Sin & Redemption ranks as one of our favorite bars there. A fine selection of imported ales and lager fill the beer menu. Smokeless Joe's, one of the first Toronto pubs to ban cigarettes, drips with personality. The owners and managers gladly express their love of great beer to regulars and visitors alike, and the summer food menu features "Oyster Mania" on Mondays and Tuesday with a dozen Malpeque oysters for only $12 (and some of the best mussels you'll ever try). Volo, just around the corner from Local 4 (see above), boasts a ton of impressive bottled beers alongside a mouth-watering selection of drafts and cask ales. This Yonge Street legend is loaded with appeal and superb craft beer. After your visit to the CN Tower, head across the street to the famous Steam Whistle microbrewery - open for tours noon to 5 PM. An independent brewery housed in Toronto’s historic John St. Roundhouse, this brewery produces only one beer - a refreshing, European-style Pilsner made with only four natural ingredients. Steam Whistle Pilsner is packaged in signature green glass bottles, cans and draught, and is shipped across Ontario, Alberta and British Columbia. Steam Whistle welcomes more than 80,000 visitors to the brewery each year, and the production line actually includes an authentic steam whistle that brewery visitors can blow. Steam Whistle values the environment and practices many "green" initiatives that include biodegradable sampling cups, clean fuel for brewery vehicles, steam heat, energy efficient equipment and eco-friendly waste disposal.